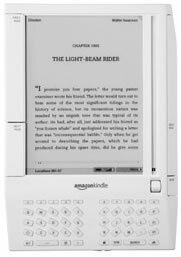 Kindle VS Hanlin eReader V3 – comparison (Updated) | FreshTech. The following is a detail comparison between the Hanlin eReader V3 and kindle. Uses E Ink® – technology. The result is a reading experience that’s similar to paper . Optional: customization to support customer specific content format. Download content directly the PC. Use USB cable to transfer content from your computer to reader. No mention of content store associated with the company. It is therefore assumed that any content that is accessible on your computer in compatible format can be downloaded to the Hanlin V3 form the computer via USB cable. Goes a month without recharging – with an average of about 300 pages of reading per day. Hanlin – Assume to be needed for content download on Hanlin, since there is no mention of wireless capability. Kindle – Needed only when not in wireless coverage area for Kindle. All other formats are equal. Both offer additional storage up to 4 GB via SD expansion cards. Kindle – Wireless connectivity when in coverage area. Hanlin – No mention of content. It is assumed that content can be download from computer from various sources as long as it satisfies the compatible formats. Kindle – Numberous content available from the Amazon Kindle store including book, magazines, blogs, Newspaper, plus content from other sites with compatible formats. Kindle holds a lot more books in internal memory, but both are equal in expansion capacity. Kindle – Read for a week on full charge, no specific per day rate. Kindle offer wireless service without associated fee while Hanlin offers no wireless service thus no fee. Kindle seems to offer more in lot of areas and may be the better buy. Here’s a video that gives a little more detail about the Hanlin V3. Information about this device is pretty much hard to come by…you can’t even find anything on eBay or Amazon (at least not yet) and that’s saying a lot. If you want to buy the device, you have to order it directly from the <a href=”http://www.jinke.com.cn/Compagesql/English/embedpro/index.asp”>Chinese distributor</a>…Personally, I am very skeptical about buying form overseas companies in this manner. I have to be able to track my money to an from the distributor so that if anything goes wrong, I can get a refund. Anyway I tried to pull out what I deem the most important points from this video and add it to the comparison I had written a while back. Hopefully you can glean enough from it to help make an informed decision about whether or not to buy. If you buy…good luck… tell me how it goes. I will wait until it becomes available on Amazon or eBay. That said, I can only give you a third party review, since I don’t own the device yet. Hanlin V3 comes with 1 GB memory card for content storage….<a href=”http://astore.amazon.com/amazonkindle_01-20″>kindle</a&gt; comes with none. If you need a memory card you will have to buy it separately. Hanline V3 does not support Mobipocket content format so your content access is somewhat limited.. This I think further compounds the content conundrum which I mentioned in an earlier comparison…no specific mention of where to get content. Kindle, on the other hand, support this format thereby giving you access to a tremendous amount of additional content outside of what Amazon offers. Hanlin V3 displays approximately 9,000 page with full batter charge…that’s lot of pages. It’s left to be seen if it really does. kindle must be recharged every other day when wireless is on… Turn the wireless off and you can read for a week or more before recharging. I don’t know what this means in terms of pages. My personal experience tells me that I need to recharge every 4 – 5 hours of reading which amounts to about (never counted)… pages depending on the font I am reading with and the Kind of content I am viewing…photos use more battery power…not to mention the fact that I usually have wireless on. The point is you can never be sure about these battery longevity claims…just read and keep your charger close by regardless of device. Hanlin V3 zooms text to make bigger, larger font is displayed in landscape mode which means you see less content while viewing larger font which account for more page turns. Kindle offers six levels of font adjustment…no continuous variation of font adjustment here. Hanlin displays PDF with some difficulty, cannot display every file especially the bigger ones. Kindle’s PDF file display is still in the germination stage or as Amazon calls it, experimental phase. so not much difference here between the two. Both devices plays MP3 music. Hanlin V3 cannot access MP3 music while reading books which means no to background music. Kindle, on the other hand, allows you to play MP3 music background music while reading. The Kindle is NOT restricted to a 4 GB SDHC card as it says here. I use a SanDisk 8 GB SDHC memory card, which is the maximum available right now. But SanDisk has said at the consumer electronics show in Las Vegas that they will have a 16 GB version out mid year, and a maximum sized for this medium 32 GB version out by year end 2008. I recommend SanDisk’s Ultra II Speed version, as users have reported problems with other brands without this speed. Hanlin supports a whole load of other languages including asian ones such as Chinese, Japanese, and Korean. Kindle is Western only. The lack of support for CHM, FB2 and DJVU is decisive for me. Kindle is NOT a device for me. You can always sell or give away the Kindle. Of course, it’s tied to your Amazon account unless you unregister it, and then you lose the DRMed content. Best feature: you can re-download books, years later, to the Kindle. Worst feature: I can’t share a book with my wife if we both have Kindles (we have separate Amazon accounts). I’m stuck looking for un-DRMed formats in this case. One thing not mentioned about the Kindle is that you are tied to Amazon’s somewhat predatory pricing. Naturally, you can load the many thousands of free ebooks available in many formats, but if you are doing that, why bother with the Kindle? Free converters for .prc, .pdf. and other formats are readily available, so format isn’t really an issue. I also have to keep in mind that I have never dealt with Amazon without there being some kind of problem. Finally, the BeBook http://mybebook.com/p5/BEBOOK-Digital-book-reader/product_info.html seems to be the same device as the Hanlin V3. but much more available and with equal value in terms of accessories included, etc. This needs another update as the Hanlin is now in the guise of My BeBook. Now has mobipocket and RSS and wireless coming soon. Kindle is still not available outside the US and Canada, and is danger of missing the boat in UK and Europe where Sony Prs 505 and BeBook are getting into the shops. I love the idea of a UK/Euro version of Whispernet, but the BeBook seems to offer more freedom of choice of where to get and read downloads. I have spent a lot of time reading .LIT files on an older PDA from Toshiba, A Tablet PC in Windows XP tablet, and looked over the older PS and a few other off branded readers. I enjoy the .LIT format most.. at least so far.. and i am baffled that BeBook Reader and Hanlin are only supportive of NON DMR books. Thats great and all.. but if i am going to be downloading books that must be validated by MS or some other formate.. then i am trapped reading only Off market books, free Mags , comics and such. Has the Hanlin or the BeBook Reader updated it’s ability yet? can we read DMR’D books yet? i have quite the collection i would like to PORT into the READER.. and I do prefer to use LINUX systems as a RULE now. I hope some one answers this. (1.Add mobipocket parser (Beta), support mobipocket format (prc and mobi) and DRM. 2008-09-26) I’ve already brought one book with DRM on it, it worked for me. It’s text flowing has also improved considerably. I hope jinke pushes these devices more, the more competition in the e-reader market the better because it will drive prices down.